One of the four leading Old Masters of the 16th century German Renaissance - the others being Albrecht Durer of Nuremberg, Matthias Grunewald of Mainz, and Lucas Cranach the Elder of Wittenberg - Holbein dominated portraiture in Switzerland and England during his day, proving himself a worthy successor to earlier Northern Renaissance artists of the Flemish School under Jan van Eyck and his follower Petrus Christus. Born in Augsburg, Holbein was active first in Basel (1515-26) and then London (1526-28), before returning to Basel for four years (1528-32) in order to maintain his citizenship. Soon after his return to Basel, he bought a house in St Johanns-Vorstadt with the proceeds of his London commissions. Unfortunately, the iconoclastic fallout from Luther's Revolt was beginning to have its effect. Demand for fine art - other than propagandist Protestant Reformation art - was at an all-time low. Fortunately, perhaps due to his return from England, Holbein retained the confidence of the new City Council. He was asked to complete the mural paintings for the Council Chamber of the Town Hall, which he had helped to initiate in 1519, although the new Lutheran regime obliged him to use Old Testament themed Biblical art for the murals instead of the previous mythological themes, as before. He also did private work for former clients like Jakob Meyer, including some altarpiece art and portraiture. It was also during his stay in Basel that Holbein painted The Artist's Family (his wife Elsbeth Schmid, with their two eldest children, Philipp and Katherina) (1528, Kunstmuseum Basel). In the Spring of 1532, almost certainly due to a lack of patronage, Holbein said goodbye to his family and set off back to London. Holbein's initial commissions during his second and final stay in England, included a number of portraits of Lutheran merchants of the Hanseatic League, the commercial confederation of merchant guilds active in cities along the coast of the Baltic and the North Sea. In London, the Hanseatic merchants lived around the Steelyard, a complex warren of storehouses, offices, and dwellings on the north bank of the Thames. Located south of Cheapside, this Hansa area boasted its own guildhall, weighing house, chapels, and counting houses, and formed the largest single medieval trading area in London. To facilitate his sitters, Holbein rented a house in nearby Maiden Lane as a studio. His two greatest portrait paintings of Hanseatic merchants were the portrayals of Georg Gisze of Danzig and Derich Berck of Cologne. In addition to portraiture, Holbein completed two large-scale works of mythological painting for the guildhall of the Steelyard, as well as a large piece of street art for Anne Boleyn's procession through the city on 31 May 1533, the eve of her coronation. 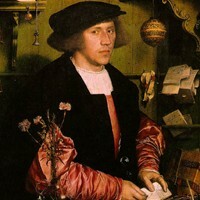 Portrait of the Merchant Georg Gisze of Danzig was Holbein's first important painting for the Hanseatic League. The well-bred Georg Gisze (1497-1562), originally from Cologne, was an active member of the League who was stationed in London until 1535, when he returned to his home city of Danzig (Gdansk, Poland) where he married Christine Kruger. It seems likely that Gisze commissioned the portrait following his betrothal and in anticipation of the marriage to come. In his usual way, Holbein combines the Italian Renaissance tradition of monumental form with the Northern European manner of detailed representation. Thus in addition to his masterful portrait of Gisze - marked by his exact reproduction of his facial colouring, the texture of his hair, and the pink robe with its intricate set of creases and light-catching sheen - the painting also contains a number of precisely created objects relating to the merchant and his way of life. He is shown, for instance, standing in his workroom, surrounded by the artifacts of his trade - the handwritten contracts, bills of lading or cargo manifests of the shipping business, as well as a pewter writing-stand with goose-quills, ink, sand, sealing-wax and a seal. Also on the table in front of him is a beautifully painted Venetian-glass vase, containing carnations, the latter being a medieval symbol of betrothal. The picture also contains a number of moralistic messages of the type made famous by the Dutch Realism movement in its Vanitas painting of the 17th century. Such forms of Protestant art, mostly based on quotations from the Bible, enjoyed widespread popularity among well-to-do Northern Protestants. Thus, on the rear wall, next to a pair of scales, we see the Latin motto "Nulla sine merore voluptas" ("No joy without sorrow"). In addition, close to the table's edge, precisely placed in the centre foreground, stands a small table-clock, which - along with the delicate glass vase and the perishable flowers - reminds us of the passage of time, and thus the transitory nature of earthly life. One particular feature which is best appreciated when we see the painting in the flesh, so to speak, is the thick tablecloth with its intricate abstract patternwork. This exemplifies a tradition of highly detailed brushwork which was first seen in 15th century Flemish painting - whose exponents were the first to master the medium of oil painting, without which such detail was impossible - notably in the depiction of floor coverings, robes, drapes and tapestries. Note: Other paintings executed by Holbein during this time, include: Portrait of Nikolaus Kratzer (1528, Louvre, Paris) and Portrait of Hermann von Wedigh (1532, Metropolitan Museum of Art, NYC).  For more outstanding Northern Renaissance paintings and portraits, see: Homepage.